Strawberries are plentiful, and they are ripening very quickly in this heat. So grab them now! The currants and gooseberries are ripening, you can start to pick some already. You will see the creeping raspberry growing, and the strawberries. If you're looking to give wild food a go, wild garlic should be top of your list, says Rob Cowen. Trust me. Whatever you’re planning on cooking with this weekend, it won’t come close to this dish. And at its heart is a spear-shaped leaf that is rightly celebrated for its taste. In fact, if you really want to give wild food a go, this should be one of your first picks. Wild garlic is easy to identify and absolutely delicious. Most importantly perhaps, it’s prolific. Even the most avid picker will struggle to dent its numbers. Between March and July there’s no real need to buy bulbs of garlic in the supermarket. Wild garlic or ‘ramsons’ refers to the leaves of Allium ursinum, a distant relative of chives, that delivers a really unique take on that most ubiquitous of ingredients. You don’t eat its bulbs but - bold, bright and fresh - the leaves are seriously pungent but ease nicely with cooking to give a real depth to dishes. 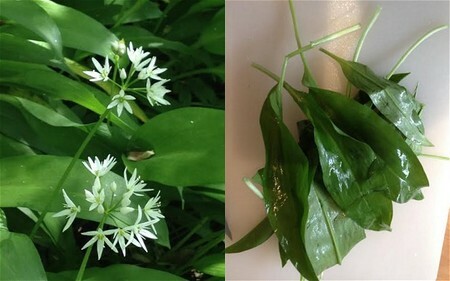 Found in pretty much every deciduous British woodland or riverbank (and often in graveyards and hedges – signs that the area may once have been a wood), wild garlic likes damp ground where it erupts in ranks of sprays, each with a pointed, green leaf growing on a single green stem. Where you find one plant, you usually find many, a sea of the stuff sloshing down banks and river culverts. At this time of year the flowers (a nice edible addition to a plate) are also a giveaway: delicate, thin, six white-petalled things forming into rough globes that look like exploding fireworks. The true test of wild garlic however is the scent. Usually you will smell it before you see it. It perfumes the woods. So follow your nose and break a leaf to check. It will remind you of a powerful spring onion. Chose plants in sites that are, ideally, on a slope - these are less likely to have had any human or animal traffic – and pick healthy leaves from far down towards the ground, keeping the stems long. This will be useful if storing the garlic as you can pop it in a pint glass filled up with water and it should last three or four days without losing any freshness. Stick your haul in your jacket (if you don’t mind the lingering scent) or double-up a plastic bag or water bottle. Once home, wash it thoroughly under a tap or in a few changes of fresh water. Wild garlic is the perfect substitute for basil in a fresh pesto or, like jack-by-the-hedge, it loves to be turned for a few minutes with butter, Parmesan and pasta. 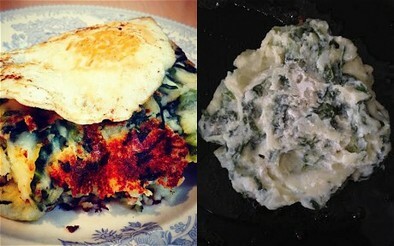 That said, my top recipe has to be this wild garlic bubble and squeak. With its crisp, brown edge and soft, cheese and garlic middle, it is, quite simply, amazing whether served on its own or as a side to a grilled pork chop. I’ve tried making it without wild garlic and it’s never the same so get out there this weekend and fill your pockets. This is the real taste of spring. Start by peeling the potatoes and boiling in salted water until soft. Drain and add the butter. Mash until floury and add a splash of milk, salt, pepper and the cheese, mashing until you get smooth, creamy, cheesy mashed potato. Slice the wild garlic thinly and stir in, before replacing the lid and setting aside. Slice the spring greens or cabbage and boil for seven minutes, then drain. Add to the cooling mash and stir in. After another ten minutes, dust a work surface or large chopping board with plain flour and spoon the mash onto it. Push down into side-plate sized cakes that are about 2cm think and turn over to ensure a good coating of flour on both sides. Heat the olive oil in a frying pan and, when hot, fry the cakes for seven minutes on each side. Don’t be tempted to turn them over too quickly; let each side go golden and get crunchy. Keep warm in a low oven. In the oil, fry the eggs both sides, keeping a slightly runny centre, then place one bubble and squeak cake on each plate and pop an egg on top.